Many gemstones have long and storied histories. For centuries people have been mesmerized by the beauty and glamour of gems, assigning different meanings and symbolism to these precious stones. While much of the mythology and folklore surrounding gemstones must be taken with a grain of salt, it’s nevertheless a fun exercise to explore the meanings and ideas behind the stones that have taken hold over the ages. After all, if a person feels more positive while wearing hessonite (which is said to remove negative feelings), perhaps that’s all the truth the wearer needs! Let’s explore the meanings, symbolism, and history behind several popular colored gemstones, including colored diamonds. Peridot – Pronounced like it’s spelled (pear-ih-dot), this brilliant green stone is the birthstone for the month of August, and it is said to bring wearers good luck, success, and peace. 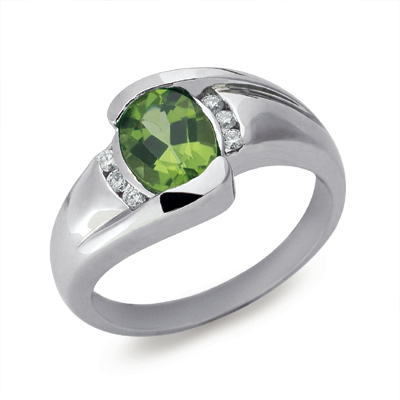 Peridot is also thought to remove feelings of stress, fear, and guilt. The name peridot is derived from the Greek word “Peridona,” which translates to “giving plenty.” Peridot is formed deep within the Earth’s mantle and is found in abundance in Hawaii. Much folklore surrounds this gemstone among Native Hawaiians. Peridot has come to be associated with Pele, the Hawaiian fire goddess.1 Many Native Hawaiians believe that peridot is made of Pele’s tears. Hessonite – Also called “cinnamon stone” for its rich red-orange hue, hessonite is said to eliminate feelings of inferiority and negativity in wearers. In Indian mythology, hessonite comes from the fingernails of the God Vala. Today, this stone is mostly mined in India. Pink Tourmaline – The official birthstone for the month of October, pink tourmaline is also the stone for the Zodiac sign Leo. Pink tourmaline is one of the most sought-after colors of the gemstone, which is found in many colors ranging from black, to blue, to hunter green, to pink—there is even a “cat’s eye” variety. The mythology suggests that tourmaline has such a wide variety of colors because it traveled across a rainbow, picking up all the colors along the way. Tourmaline is believed to inspire creativity and strengthen the body and spirit. Aquamarine – The official birthstone for the month of March, and the Zodiac sign Pisces, aquamarine is said to bring joy, happiness, and harmony in married life. It’s also said to calm nerves and impart strength in wearers. Legends surrounding aquamarine extend as far back as ancient Greece, when people thought the stone was sacred to the god Poseidon. Legend also has it that sailors first discovered the stone in the treasure chests of mermaids; as such, aquamarine has for centuries been thought of as a lucky stone for sailors. Citrine – The official birthstone for the month of November as adopted by the American National Association of Jewelers, citrine ranges in color from yellow to reddish-brown. This popular gemstone also symbolizes the Zodiac sign Virgo. Spiritual healers believe citrine helps the heart, liver, kidneys, digestive tract, and muscles. It is also thought to promote creativity and reduce destructive tendencies. Ammolite – A truly unique stone mined from the North American Rocky Mountains, ammolite is made of the fossilized shells of extinct nautilus-like marine invertebrates. Ammolite contains aragonite, which is what gives ammolite its beautiful colors and iridescent sheen. Each piece of ammolite is truly unique. Since ammolite was only recently discovered (in the late 20th century), there is not much established folklore or mythology surrounding the stone, but this will undoubtedly change as time passes. 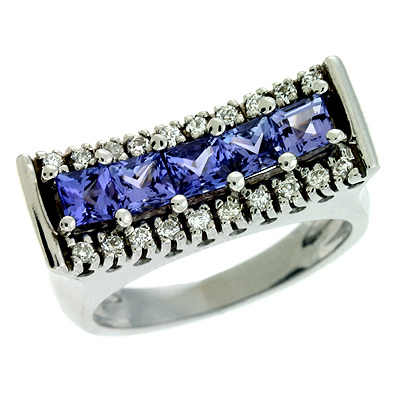 Tanzanite – This striking blue-purple gemstone was originally discovered in 1967 in Tanzania—hence the stone’s name. There is little folklore around tanzanite, since it was only recently discovered; however, spiritual healers believe it improves spiritual awareness and stimulates insight. Some believe that tanzanite stimulates the third eye chakra, helping wearers communicate their visions—for this reason, tanzanite is said to be the stone of magic. Diamonds range in color from clear to black and everything in between. Colored diamonds are in a category of their own, and are often referred to as “colored fancies.” Let’s explore the different diamond colors found today, and the meanings and symbolism that have come to be associated with these colorful stones. Yellow diamonds: These rare gems range in hue from very light yellow to more deep yellow hues when more nitrogen is present in the stone. The color yellow is associated with optimism, playfulness, and sociability. 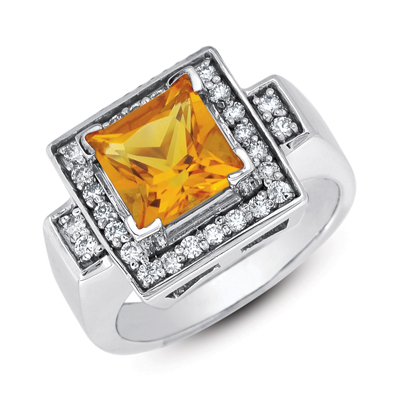 Yellow diamonds are a good choice for those who are adventurous, creative, and fun-loving. Pink diamonds: Pink diamonds are extremely rare, and are seen as true expression of affection when given as a gift. Pink diamonds are thought to promote creative expression, and are ideal for those in creative professions, such as writers, dancers, artists, and filmmakers. 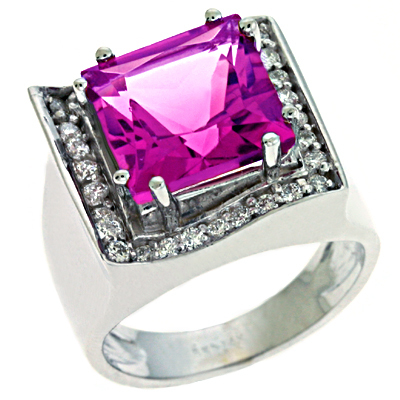 Purple diamonds: Also very rare, purple diamonds are generally found in one of two hues—violet and purple. 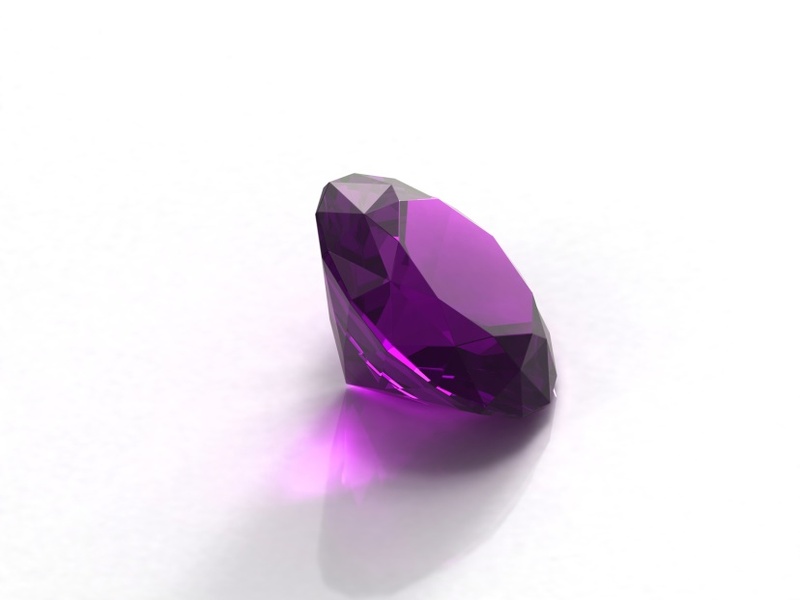 Purple diamonds are associated with spirituality, enlightenment, and pride. They are a good choice for philosophers, artists, sociologists, and psychologists. The color purple has also long been associated with nobility, wealth, and power. Blue diamonds: Blue diamonds are extremely rare and are harvested almost exclusively from a few mines in South Africa and Australia. Blue diamonds are said to convey confidence, strength, and loyalty. They are a good choice for those with outgoing, colorful personalities, and for romantics. Green diamonds: A symbol of nature’s bounty and harmony, green diamonds are found in a variety of hues, with many overtones and secondary colors. The green color comes from radioactivity. Green diamonds are also a symbol of money and long life. Green diamonds are a good choice for bankers, investors, and nature lovers. Brown diamonds: Brown diamonds (sometimes called chocolate diamonds) are said to symbolize stability, practicality, and dependability. They range in hue from light (Cognac) to darker hues (champagne). Brown diamonds have a subtle but unique beauty, and are ideal for down-to-earth, practical, and good-natured folks. Black diamonds: For a bold statement, black diamonds are ideal. These gems are said to symbolize prosperity, strength, and fidelity. Black diamonds are a fashionista’s best friend—chic, sophisticated, confident, and bold. We hope you’ve had fun exploring the history, mythology, and folklore surrounding some of the most popular gemstones and colored diamonds! The Diamond Vault is your expert jeweler—call on us to answer any questions about the many gemstones available on our site.